There are some times in a person’s life when speed is of the essence. Grabbing the last Snuggie off the shelf, racing for the last cookie in the cookie tin, or finding a Kleenex right before you feel a wet-sneeze coming on. Another time you might need to be “quick like ninja” is if you’ve got a couple of very hungry kids to feed early in the morning who want to be fed n-o-w, NOW! If that could be (or is or has been) you, then you might want to consider buying a can of Organic Batter Blaster. 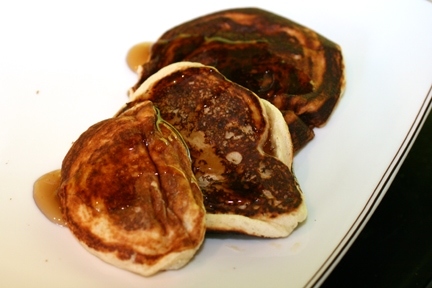 What makes the Organic Batter Blaster Original Pancake and Waffle Batter unique is that it is a completely prepared pancake and waffle mix that is ready to cook once you pull it out of the fridge. You don’t need to add water, you don’t need to mix – all you have to do is shake the can and squeeze. If you ever squirted ReddiWip into your mouth (admit it – you have!) 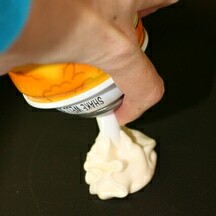 then you can use the Batter Blaster can because it works in exactly the same way. The batter is pressurized into an eco-friendly, recyclable can and is dispensed by pressing the nozzle. 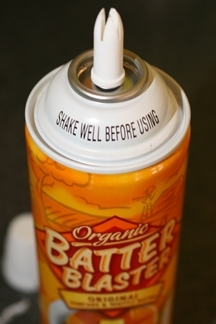 Batter Blaster batter is made from USDA-certified organic and Kosher ingredients and with each can, and checking the can, you don’t see any chemicals or preservatives. Each can makes about 28 4″ pancakes, but that number can change if you get creative with your batter. For example, since you’re using a nozzle to dispense the batter (instead of a ladle) you can make shapes with your pancakes. The kid testers decided they liked heart and apple shaped pancakes. The fact that the kids could get so involved in how the pancakes looked made preparing breakfast a lot of fun for them. I recall when I was little how much excitement I had when my dad put my initials in the pancakes. Sadly, since I made my pancakes first, I didn’t show the batter shaping dexterity that one of the other chefs had, so my pancakes were simply little circles. Once you have the Batter Blaster batter in the skillet, you’ll see the batter start to develop the little air bubbles and the edges will start to brown. At this point, you’re supposed to deftly flip the pancakes over. I’m not sure if it’s a too thick pancake flipper or the super non-stickiness of my new skillet, but I had serious problems flipping over the pancake. It had nothing to do with the Batter Blaster and everything to do with my skills. I promptly went out to buy a new pancake flipper (what’s the actual name for that kitchen utensil?) so I’d be able to do better next time. I’m actually super embarrassed to show this picture of the final pancakes I made because it truly displays my shoddy flipping. If the pancakes appear extra brown to you (and kind of smooshed on one side), it is SOLELY because I couldn’t flip the pancakes over fast enough. 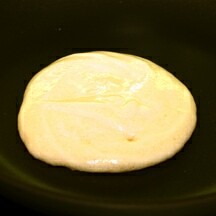 I found that the Batter Blaster pancakes are best eaten when they’re fresh off the skillet. That ensures that you’re eating them at their fluffiest since they might flatten out a little over time, which is typical with other pancakes I’ve eaten (even ones from scratch.) The kids absolutely loved these pancakes for their Sunday morning breakfast and ate them up faster than new ones could be cooked. For a quick, kid-friendly breakfast, you can’t get much faster or easier than Batter Blaster. To learn more about Organic Batter Blaster Original Pancake and Waffle Batter you can visit their website – www.batterblaster.com. You can also become a Batter Blaster Facebook Fan or follow them on Twitter to stay on top of special coupons and offers. If you would like to win Batter Blaster, you can enter the Batter Blaster Twitter/Facebook Challenge. I agree that this batter is great! 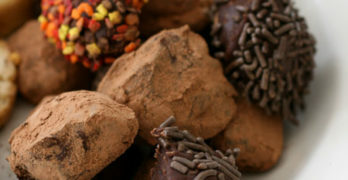 When I was nursing my daughter and on a dairy restriction, these fit the bill. Who would have thought pancakes could make a new momma so happy?